Screenshot of Louis Sako addressing his congregation on Christmas Eve, published on Youtube on December 24, 2017 by Al-Mawsleya channel. Iraqi Christians celebrated their first Christmas in Mosul since the city was liberated from the brutal militant group ISIS (also known as ISIL, Daesh and the Islamic State) earlier in 2017. 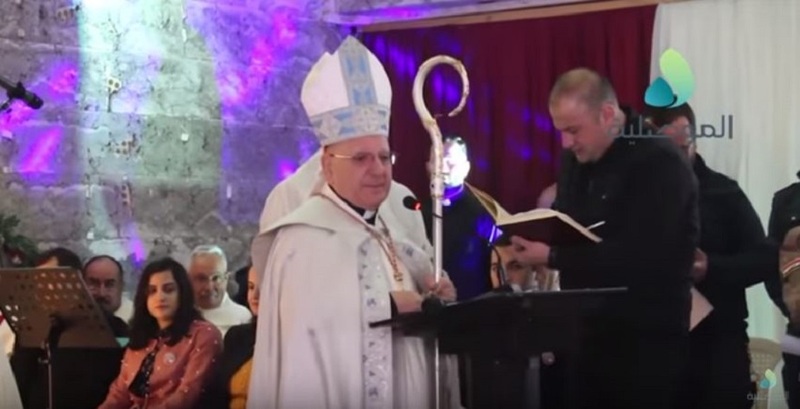 Christmas Mass was held at Saint Paul's Church, currently the only functioning church in Mosul, with an attendance of around 100 Christians. A host of local and military officials also attended, in addition to a number of Muslims joining to show their support for the minority community. Under tight security, Mass began with the Iraqi national anthem, imparting a strong sense of national unity to the occasion. Mosul's Christian community is centuries old and an important part of the diverse mosaic that makes up the city. Around 200,000 Christians lived in Mosul prior to the violent ISIS takeover of northern Iraq in 2014. The city was emptied of the ancient community after facing an ultimatum to either convert to their intolerant version of Islam, pay a religious tax, or die. Most families fled and were stripped of their personal belongings along the way. While the past three years have been devastating for Iraqi Christians, Sako is urging Christians displaced throughout Iraq and those who have found refuge abroad to return and play a role in Mosul's reconstruction. In an interview with international news agency Agence France-Presse (AFP), Dourid Tobia, an adviser on Christian affairs to the provincial governor, claims that between 70 to 80 families have returned and expects more to follow soon. Christmas celebrations also took place in Christian communities across the Nineveh Plains and Baghdad at several different churches. The first Mass in the city of Qaraqosh after years under violent Islamic State rule. Iraq would not be without its Christians, Yazidis, and other communities. The first Christmas Mass at Saint Paul's Church in more then three years. Thanks to the martyrs who made this victory possible. I have to ask, why did ISIS emerge and thrive under President Obama’s 8-year watch and it took President Trump to defeat them.